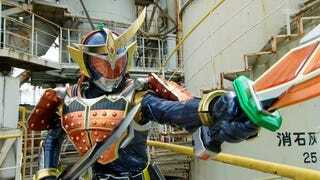 Kamen Rider Gaim, the latest entry in the long-running Kamen Rider series, is quite interesting. It's samurai-themed, but uses fruit motifs throughout the show. That no longer raises eyebrows among viewers. A recent map that appeared on the show, however, does. Kamen Rider Gaim takes place in a fiction city called Zawame. On a recent episode, a Zawame city map appeared on screen. To some viewers, it looked familiar. Above is the Zawame map with the red Xs, and below that is a map of Gotham City from Batman. Online in Japan, people criticized Kamen Rider Gaim for allegedly copying the Gotham City map. This could very well be more of an homage and less of a lazy rip-off. Maybe! Website Get News points out that the newspaper headlines have the letters "Ba," "rmese," and "t." So maybe, "bat?" The "rmese" could be short for "Burmese," which was mentioned in The Dark Knight. Yeah, thin. I know. But, as the Kamen Rider Wikia points out, this episode is thematically similar to The Dark Knight: Zawame City is sealed off from the rest of the world, much like Gotham City was. So, scratch this one off as an homage?